"Russet potatoes are blended with roasted garlic, butter and milk. This recipe is a standard." Drizzle garlic with olive oil, then wrap in aluminum foil. Bake in preheated oven for 1 hour. Bring a large pot of salted water to a boil. Add potatoes, and cook until tender, about 15 minutes. Drain, cool and chop. Stir in butter, milk, salt and pepper. Remove the garlic from the oven, and cut in half. Squeeze the softened cloves into the potatoes. Blend potatoes with an electric mixer until desired consistency is achieved. 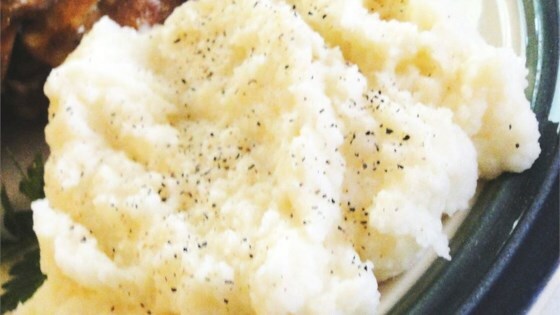 The sweet flavor of roasted garlic makes these mashed potatoes to savor. This is an amazing recipe. Keep an eye on your roasting garlic as half an hour works for me. I have this when having Amy's Osso Buco. Perfect match.